Happy New Year everyone! I hope your 2018 is off to a great start. 2017 was a great year for me, but ended on a bit of a crazy note with both my daughter and husband getting the flu in December (I don’t know how I avoided it, but I did), and work being really busy. Hence why the blog was quiet last month. I didn’t even do my nails all month cause I was just so tired all the time. 🙁 But I finally had the chance to do them for New Year’s Eve (yay!) and here they are! 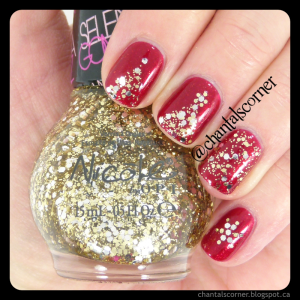 This is from the Gumdrops collection from Nicole by OPI and is called A-Nise Treat. The brush is wide and thin and works really well. 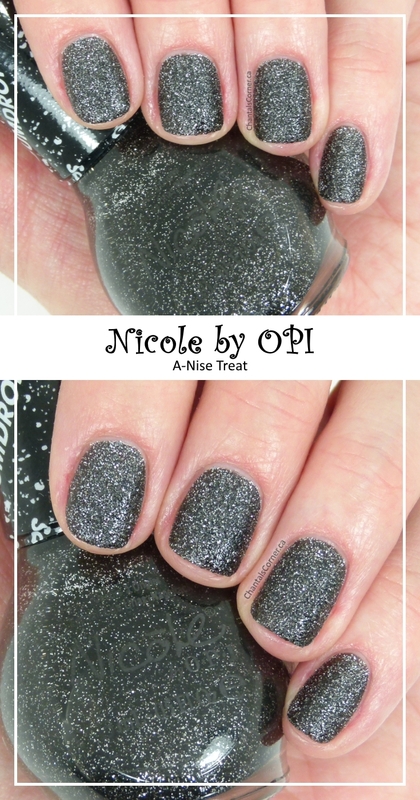 A-Nise Treat is a textured polish with a black base and tiny silver hex glitters. It dries to a matte finish and you do NOT add a top coat. You could if you wanted to, but I did not. They say you only need two coats, but I found that it was not quite opaque with two coats so I added a third coat. And voilà, perfect coverage! 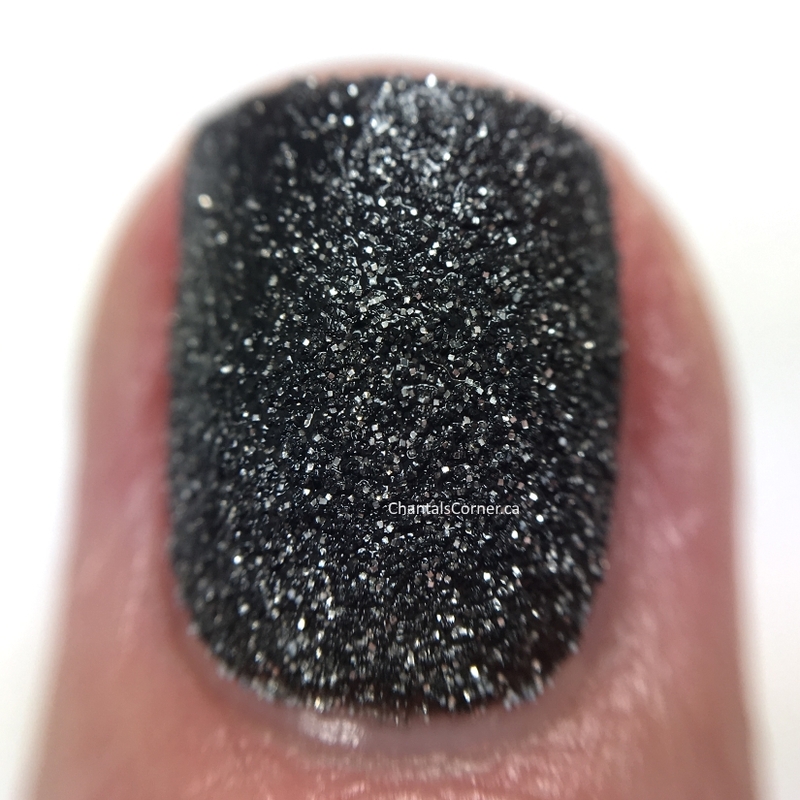 I had to get a macro shot to get a better view of the glitter, so here it is. The polish looks wet cause it’s really shiny, but I assure you that it’s dry and looks matte from a normal distance. Interesting how that is, huh? 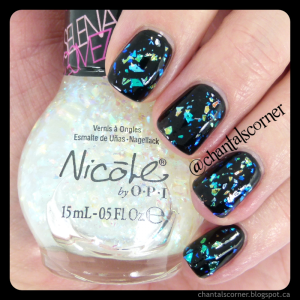 I did something new this time, I took a video to try to show you the sparkle! It’s SO PRETTY in real life. My brother and sister-in-law are moving/downsizing and she gave me 95% of her nail polish – including her Helmer! This is one I got from her and I absolutely LOVE it! Merci Caro!!! I did my nails this past Saturday and today, Thursday, I only have very minor wear at the tips. It’s lasting so well! Have you tried any polishes from the Gumdrops collection?